John Earman is a philosopher of science who in 1986 wrote a most influential book on physical determinism. His A Primer on Determinism describes the history from the classical mechanical determinism in pre-Newtonian physics to quantum mechanics, which he claims is more deterministic than classical mechanics. Earman is also co-author of the 2006 Philosophy of Physics (2-volume Handbook of the Philosophy of Science) with Jeremy Butterfield, Dov M. Gabbay, and Paul Thagard. The determinism-free will controversy has all of the earmarks of a dead problem. The positions are well staked out and the opponents manning them stare at one another in mutual incomprehension. No advances in philosophy of science or cognitive psychology seem to move the problem forward. (When I began writing this book I entertained the hope that getting a more precise fix on determinism would help. I now see how naive and vain my hope was.) Genuinely new ideas are scarce. Some of the most intriguing ones to emerge in recent years are to found in Robert Nozick's account of "contra-causal [read: contra-deterministic] freedom"; but, I am sorry to report, the account is ultimately inscrutable. Finally, and, worst of all, for those of us who are not attached to one of the standard positions, it has become hard to sort new proposals into the serious and the nutty. If the problem keeps leading us up blind alleys, why can't we walk away from it? Because the issues it joins are essential to an understanding of human action and of man's place in nature. Here we have a major clue as to why the problem has proved so divisive and why it resists any neat resolution. And we also have an early indication that 'the determinism-free will problem' is a misnomer: though the apparent conflict between determinism and free will helps to focus our attention on puzzles about human action, the puzzles go for beyond anything to do with determinism and free will per se. Rather these probabilities have to be seen as propensities for the system to undergo a transition from potentialities to actualities, and again we have no coherent account of this transition. In sum, while irreducible stochasticity may be an idea whose time may come, it is far from clear that QM marks its debut. Previous chapters have detailed a number of ways in which Laplacian determinism and its close relatives can fail, but not one of those cases conformed to the standard philosophical picture of indeterminism rooted in an irreducible chance or stochastic element. Quantum physics promised to bring that picture into focus, but today, over three quarters of a century since the advent of the quantum theory, we have only a blurred image. An astounding — and frustrating — feature of the theory lies in the contrast between the exquisite accuracy of its empirical predictions on one hand and the zaniness of its metaphysical 'consequences' on the other. The theory has been used to 'prove' not only that determinism is false but that realism fails, that logic is non-classical, that there is a Cartesian mental-physical dualism, that the world has the structure of Borges' garden of forking paths, etc. One is tempted to say that any theory which proves all of this proves nothing. But the temptation must be resisted. Although it is not clear what the quantum theory implies about determinism, it is clear that the implications are potentially profound. Bringing the implications into sharper focus requires a simultaneous focusing of a host of other foundations issues, most especially concerning the nature of quantum magnitudes and the nature of the quantum measurement process. By now it is no surprise that pressing the question of determinism has helped to unearth the deepest and most difficult problems that challenge our understanding of the theory. I have no new solutions to offer. Nor do I have a magic Ariadne thread that will guide us painlessly through the maze of claims and counterclaims. But I do hope to be able to illuminate the role determinism plays in generating the controversies, and secondarily I hope to show why thinking about these controversies is like banging your head against the wall. The philosophical discussion of the determinism-free will problem has been badly skewed by the tendency to locate it within the context of questions about moral and legal responsibility. This context produces an almost irresistible pressure for a compatibilist solution, a pressure exploited by Moritz Schlick and his followers. My complaint is not that Schlick's solution is incorrect; indeed, I think that Schlick is roughly right about the sense of free will relevant to ordinary ascriptions of responsibility. Rather, my objection is that Schlick's solution is shallow and comes to grips with only a small piece of the larger problem. (C1)	People should be held responsible for their action unless there are exculpating circumstances. (C2) Circumstances which make it impossible for a person to act freely are exculpating. (C3)	Discoveries in physics and the life sciences indicating that determinism applies to people as well as inanimate particles would not undermine ascriptions of responsibility. Finding innocents ready to volunteer (C3) may not be easy, as witnessed by the recent New Yorker cartoon. Hobbes' and Hume's view of freedom as compatible with determinism. (C4) Freedom is the absence of compulsion, coercion, constraint. For it is just these factors — compulsion, coercion, and constraint — which would be regarded by the real-life counterpart of the New Yorker judge as being exculpating. The title of the chapter in which Schlick discusses the free will problem — "When Is a Man Responsible?" — is a giveaway as to his analysis of freedom. A man is free for Schlick just in case he does not act under compulsion, coercion, or constraint. These factors apply just when a man is prevented from realizing his natural desires. Freedom as the absence of these factors is quite compatible with determinism since natural laws do not entail them — laws of nature do not prescribe what happens but only describe it. Punishment is justified as an "educative measure," serving to "prevent the wrongdoer from repeating the act (reformation) and in part to prevent others from committing a similar act (intimidation)." This fits nicely with the analysis of freedom since it is just in those cases where freedom is lacking because of compulsion, coercion, or constraint that punishment is ineffective either as a reformative or intimidative measure. But despite Schlick's attempts at intimidation there are concerns that even our philosophical innocents will want to raise with not much more prompting than was used to get (C1)—(C4). For example, there are many different kinds of cases where the laws of nature and the relevant physical circumstances combine to make it physically impossible for an agent to perform an action A. Schlick directs our attention to cases where the agent has formed the intention or desire to do A but something, so to speak, comes between the agent's natural desire and its realization. But consider cases where it is physically impossible for the agent to, say, raise his right arm not because his arm is strapped down or because the tug of gravity is too strong but because the laws and the antecedent circumstances make it physically impossible for him to desire, intend, or will to raise his arm — his arm can go up in a convulsive twitch or jerk, but he cannot raise his arm. I take it that what Schlick would say about this case would depend on the further details. If, for instance, what has made it impossible for the agent to desire of will to raise his arm was torture, brainwashing, or the injection of mind altering chemicals, then by a natural extension of Schlick's doctrine we have a case of coercion or compulsion and, hence a case where the agent is not free. If, on the other hand, what induces the impossibility is no such warping of the agents 'natural' desires but the unfolding of his 'normal' genetic heritage, then Schlick would presumably say that the agent is free to raise his arm. The odd ring to this result is in no way dispelled by repeating the incantation that natural laws do not compel, they describe not prescribe. Natural laws do not compel or prescribe in the cases where it is physically impossible for the agent to raise his arm because of the strength of the gravitational field or the strength of the straps that bind his wrists, but the impossibility is no less for that. Libertarians are incensed, and rightly so, at Schlick's accusation that their bellyache is to be diagnosed as the result of swallowing the mistaken equation 'determinism by natural laws is compulsion'; rather, their bellyache is that if determinism, whatever its ontological strength, negates freedom and undermines responsibility in one type of case, then it seems to do so in others as well. That the man-in-the-street initially agrees to sort cases along Schlick's lines when it comes to answering "When is a man responsible?" hardly settles the matter. 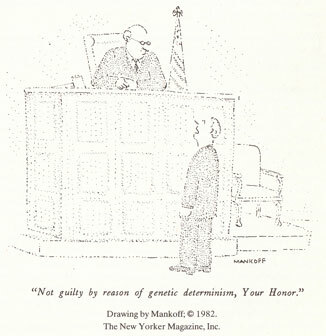 My experience is that when the man-in-the-street comes to believe that determinism applies not just to eye color and general personality traits (as the phrase 'genetic determinism' suggests) but also to the most intimate details of our outer actions and inner mental lives, then the laughter at the New Yorker cartoon turns nervous. And the nervousness, once induced, affects much more than questions about guilt and punishment. What is threatened is nothing less than the basis of the moral perspective and our sense of worth as human beings. Let us attempt to understand more fully from the Libertarian's point of view the threat that determinism poses. The Compatibilist should be interested in this goal, if only to better refute the Libertarian. To state the issues in as neutral a way as possible, let us drop for the moment questions about responsibility, guilt, and punishment and begin instead by asking questions like: How are the actions of man different from those of a sunflower as it turns to face the sun? If determinism is true, aren't all of our actions merely complicated cases of tropisms, forced motions produced by circumstances beyond our control? The Libertarian may pose such questions in a rhetorical mode, but I propose to take them literally. The immediate and obvious difficulty then is that human actions are mediated by mental states — beliefs, desires, etc., — and mental acts — willings, choosings, etc. — so that any serious answers to the question must come to grips with the mind-body problem, a problem second only to the determinism-free will problem in its divisiveness and intractability. I claim, however, that it is possible to appreciate the church of determinism without first having to solve the mind-body problem. (P) For any physically possible worlds W1 and W2, if W1 and W2 agree on all physical attributes then they agree on all mental attributes as well. Parasitism might be explained by trying to identify mental events with physical events, but whether such an identity relation is implied by parasitism and, if so, what form the identity takes (e.g., type-type or token-token) need not be settled here. Likewise, the failure of parasitism might be explained by Cartesian dualism, but again the exact form of the explanation is irrelevant for our purposes. Now suppose that futuristic physical determinism holds and that if we go back far enough in time (say, to t = —1010 years) we reach a state of the world which can be characterized in purely physicalistic terms (say, positions and velocities of particles). If (P) fails then the physical state at t = —1010 years may not uniquely determine your current beliefs, desires, and willings. But from the assumption of futuristic physical determinism it follows that in so far as your inner mental life is autonomous it is inefficacious in producing physical actions. Imagine, if you will, that you are agonizing over the decision of whether or not to pull the trigger of a S & W .357 magnum you have trained on a mass murderer. You know that if you don't pull the trigger he is sure to escape to kill again and again; but at the same time you are revolted at the thought of taking a human life and more than a little perturbed at the thought of splattering gore over your favorite Shirvan prayer rug. Some or all of these internal debates may be underdetermined by the physical state at t = —1010 years, but whatever differences are allowed make for no difference in the upshot since the state at t = —1010 already determines that you do not pull the trigger (you wimp!). Alternatively, if (P) holds then not only the upshot but all of your internal debate as well is uniquely determined by the state at t = —1010 years. Your inner deliberations combine with your outer actions to form one elaborate tropism. Various forms of this tracing-back-the-state construction are found over and over again in Libertarian tracts. The commonly cited motivation is to show, by tracing back the state to a time before the agent was born, that the agent's actions are produced by factors that are clearly not under his control. I would prefer to put the point slightly differently. In my form of the construction we see that all human actions, in so far as they are physically characterizable, are deterministically explained by exactly the same factors — those that go to make up the state at t = —1010 years — that explain the actions of sunflowers and everything else in the physical realm; and as for human mental life, either it is parasitic on the physical or else it makes no difference in producing the physical actions. Libertarians are so-called because they want to go on to join to this construction further premises: if human actions are deterministically explained by exactly the same factors that explain the actions of sunflowers, then humans no more act freely than do sunflowers; or, alternatively, if human mental life is inefficacious in producing physical actions, or else is parasitic on the physical and the physical unfolds deterministically, then true 'choice' and 'decision' are illusions. While I feel a certain sympathy for these extra premises, I am not sure that I want to endorse either and align myself with the Libertarians, and I most certainly do not want to join the Woolite wing of the Libertarians who want to do a modus tollens on physical determinism, arguing that since determinism implies unfreedom and since we are free, determinism must be false. But to state what should now be obvious, it is not just the Libertarians who feel the crunch of determinism but anyone who wants to accord man a special place in nature on the grounds that, in contrast to inanimate objects and the lower life forms, we enjoy an autonomy in that what we do is up to us. This is why Schlick's tactic of trying to saddle his opponents with the indefensible 'determinism implies compulsion', already a questionable tactic when applied to Libertarians, is completely off the mark when applied to Autonomists. There is an aspect of the tracing-back-the-state construction that has gone unremarked in the literature. Many of the fundamental physical laws we have studied are historically as well as futuristically deterministic. But we never see the construction presented in reverse form, tracing the state forward in time and then noting that by historical determinism the later state uniquely determines the present one. One obvious reason is the widespread acceptance of the notion that earlier states produce, cause, or bring about later states but not conversely. This notion was present in Laplace's original definition of Laplacian determinism and it crept into my presentation of the tracing-back construction. However, I now assert that despite all of the efforts of philosophers, the cause-effect relation in general and the notion of the direction of causation in particular remain so obscure that basing any conclusion on them makes the conclusion suspect. Suppose then that we reconsider the tracing-back construction, now taking care to understand futuristic determinism in a manner that does not entail any causal oomph. And suppose further that we agree with the claim of Ch. V that 'it is nomologically necessary that L' comes to no more than that L is part of the simplest and strongest system of occurrent regularities in the actual world. Then isn't much of the sting of determinism as it applies to human actions drawn? Perhaps, but drawing the sting in this way does nothing to soothe the Autonomist since even under the more scrupulous reading of determinism men and sunflowers are still in the same garden. There is a related but perhaps more promising way to challenge the contention that men and sunflowers are in the same garden. Granted that if Laplacian determinism holds, the actions of men and sunflowers alike are deterministically explained by reference to the state at t = —1010 years. But the actions of men are also explained by later states involving beliefs, preferences, motives, intentions, etc., and this constitutes a significant difference from sunflowers. The Libertarians and their allies the Autonomists seem to be tacitly appealing to the further principle that explanations using temporally prior states take precedence over or preempt explanations starting from later status, which principle may derive from the suspect notion that the earlier states causally produce the later ones. While I think that there is sonic justice to this charge, again I don't see that enough of the sting ol, determinism has been drawn to satisfy the Autonomist. To be concerned about autonomy one doesn't have to subscribe to the principle that the explanation starting from t = —1010 years cancels or preempts explanations starting from later states; it is enough that the former exists. It should be obvious by now that Popper's sense of 'indeterminism' does nothing to diminish the tension between determinism and freedom-autonomy, for Popper's 'indeterminism' is fully compatible with the deterministic scenario we have been imagining and it requires only that no embodied super-scientist can parallel the deterministic unfolding of events with precisely accurate forecasts (recall Ch. II).1 It is only slightly less obvious that the real failures of ontological determinism I described for classical physics (Ch. III) and general relativistic physics (Ch. X) likewise provide cold comfort for the Libertarian. Whether any form of indeterminism will foster freedom and autonomy is the topic to which I now turn. An allied sentiment often found in Compatibilist tracts goes: if a man's actions are not determined but are merely spontaneous or random occurrences, then they cannot be said to be his actions as opposed to something that just happens to him. The reader will immediately recognize that we are being presented with a false dichotomy: determinism vs. non-lawful behavior or determinism vs. spontaneity and randomness. In the preceding chapters I have tried to show just how important determinism, both as an empirical claim and as a guiding methodological principle, has been in the development of modem physics. here Earman shows what William James called "antipathy to chance"
But we have seen not the slightest reason to think that the science of physics would be impossible without determinism, and from the many examples studied we know that denying determinism does not push us over the edge of the lawful and into the abyss of the utterly chaotic and non-lawful. Nevertheless there are valid points to the worry expressed in the passage from Skinner and in the little gloss following it. One of these points was made in a vivid, if somewhat overblown way, in R. E. Hobart's (1966) famous article "Free Will as Involving Determination and Inconceivable Without It." If the rising of Alonzo's arm is to be counted as an action performed by Alonzo rather than a twitch or a jerk, then Alonzo's desire to raise his arm (or perhaps his willing his arm to go up) must in part determine the rising motion. To inject indeterminism here is not to inject freedom but to break the link that allows us to see Alonzo as the author of his action. (3)	Alonzo would have done otherwise if he had desired (willed) to do otherwise. As a test for freedom, however, (3) fails miserably, whether by the lights of the Compatibilist or the Libertarian. A Compatibilist of Schlick's persuasion would hold that Alonzo freely raised his arm if he was not acting under compulsion or coercion but simply following his natural desires. But this may be so while (3) is false. Suppose, for instance, that we can read Alonzo's desires from his brain waves and that if he shows the symptoms of not desiring to raise his arm we are, prepared to step in and raise it for him with the help of an irresistibly strong mechanical arm.' We might try to save (3) as a necessary condition for freedom by claiming that if Alonzo had desired to reach down rather than up, then he would at least have put forth an effort to lower his arm and this is enough to satisfy the spirit of (3). But if you are willing to tolerate an even more science-fictiony scenario (and you must if you are going to talk free-will with philosophers), we can imagine that Alonzo's brain has been so wired by the Evil Scientist that upon receipt of the appropriate electrical impulse from the Evil One, Alonzo is unable to exert any muscular effort to move his arm. This may be overcome by substituting a mental effort for a muscular one, but that move runs the danger of turning (3) into a tautology. And it also brings us to the Libertarian's objection of (3) as a sufficient condition for freedom. If the hand of the Evil Scientist, or the invisible hand of determinism, controls Alonzo's desires and willings so that it was physically impossible in the circumstances for him to will or desire otherwise, then Alonzo was not free by the Libertarian's lights even though (3) may have been true. Relating this to Hobart, the Libertarian may agree that Alonzo's actions should be conditionally deterministic on his desires and willings but deny that, if free, his actions, desires, and willings are deterministic simpliciter. As so often happens with the determinism-free will problem, we have come full circle and are repeating ourselves. After this excursion through one of the many byways of the free will problem, let us ask how indeterminism might help to resolve the concerns raised by the application of determinism to human actions. There are so many concerns and so many conflicting desiderata that this is a vague question, so for sake of definiteness I will impose three boundary conditions on a resolution of the determinism-free will problem. (B1) (Skinner) The resolution makes a science of human behavior possible. (B2) (Hobart) The resolution implies that the agent determines his behavior. (B3) (Autonomist) The resolution allows the agent to be autonomous in that his behavior is not a form of tropism. Broad goes on to try to show that agent determinism is a conceptual impossibility, but his 'proof' consists of no more than saying it just can't be (". . . in so far as an event is determined, an essential factor in its total cause must be other events'). My only quarrel here is with Chisholm's qualifier "in one very strict sense of the terms." In any reasonable sense of the terms the conception of the self being offered is incompatible with a science of man. First, by construction there can be no natural laws at the level of agents or selfs. Second, at the level of physical events natural laws become problematic as applied to human actions. Agent determinism is otiose if there is a perfect pre-established harmony between what the agent determines and the natural order of events, for then there would be no distinction between an event being determined by the agent vs. the event occurring naturally and undetermined by the agent. On the other hand, if the harmony is broken, one is at a loss to describe scientifically the difference the agent makes. One is at first tempted to say that the effect of the agent is a miracle — e.g., the agent determines atoms to swerve in contravention to the trajectories implied by natural laws. But in speaking thus we immediately contradict ourselves since what a law asserts must be true. Truth can be restored by building the exceptions into the law statement, but the modification removes the difference the agent was supposed to make and it saps both strength and simplicity, undermining the lawlikeness of the statement while supporting its truth.' Nor do I see that it helps to posit indeterministic probabilistic laws. Either the agent affects the relative frequencies of events or not, and either way we get a rerun of the same difficulties.' Agent determinism, so-called, pushes us toward the worst form of indeterminism — the absence of natural laws, deterministic or indeterministic, for human behavior. The self as something that is separable from and can rise above all momentary beliefs and desires and all longer term dispositions has been condemned in positivistic philosophy as a piece of metaphysical nonsense. I do not say that it is nonsense, but I do say that it cannot be the object of scientific scrutiny. We have not ruled out the possibility that there is some other way to simultaneously satisfy the demands (B1)—(B3), and given the vagueness of the conditions no final proof will ever be forthcoming. But we gain strong evidence for the impossibility by watching two of the ablest philosophers of recent decades struggle valiantly but unsuccessfully to find a workable alternative. I do not want to spoil the pleasure the reader will find at perusing the attempts of Robert Nozick (1981) and Paul Meehl (1984) to provide a positive account of free will in a setting of physical indeterminism, but it may be useful to say a few words about how these attempts fit into the framework set out above. Nozick, as I read him, is attempting to rehabilitate agent determinism or causation by bringing it down to the level of events. An agent's actions, on Nozick's account, are caused by his desires; so the spirit of Hobart's (B2) is satisfied without the need of a transcendent self as the cause of actions. Free will and autonomy are to be secured by maintaining that although the agent's actions are caused they are not causally determined since in exactly the same circumstances another action could have been performed. I think I detect in Nozick's description of this non-deterministic causation a ghost of the old agent determinism. The agent is supposed to somehow bestow weights on desires and so (indeterministically?) determine which desire prevails as the cause of the action; the old transcendent self which rises above the desires seems to have been replaced by a self which annoints desires. Meehl is concerned, as is Nozick, to rebut the charge that undetermined choices and actions are merely random or spontaneous occurrences. I agree with the rebuttal, but I get from neither Meehl nor Nozick any clear sense of how indeterminism makes the choice 'up to us' and secures for us an autonomy not enjoyed by indeterministic sunflowers while leaving us as objects of scientific enquiry. My suspicion that there is no such sense grows. Some aspects of transcendent selfs which rise above desires and annointing selfs which bestow weights on desires can be made respectable by modeling them in terms of second and higher order desires (see Frankfurt (1982)). A second order desire may be a desire that our first order desires be such-and-so or that they have such-and-such strengths; or it may be a desire to act on one first order desire rather than another (called a volition in Harry Frankfurt's terminology). While the recognition of the hierarchical structure of desires has contributed valuable insights, I doubt that it holds a key to free will, for no matter how high up the hierarchy we climb the same concerns about autonomy follow us (see Slote (1980)). Moreover, when I reflect on decisions I have made under conditions of moral conflict — just the sort of circumstances where higher order desires come vividly into play — I do not get any special sense of having acted freely. On the contrary, upon looking back, there is a sense of inevitability, whether or not I gave into my first order appetite or overcame it by reflecting on how I ought to align my preferences to accord with the good or the just. By contrast, it seems on looking back that I was most free in those cases where no moral conflict was present and no higher order desire came into play (at least not consciously); e.g., I 'just chose' vanilla over chocolate ice cream. This inverts the usual doctrine that paradigm cases of free action are to be found in cases of conflict and angst. Thinking that 'rising above' first order desires by going to 2nd or nth level desires is the kind of rising above that confers freedom and autonomy is a mistake if my introspective evidence is any guide. Of course, introspected differences in degrees of freedom may not correspond to deep or interesting differences in psychology or physiology; still, it would be nice to have a more detailed and precise phenomenology of 'free choice' than is currently available. Determinism leaves an indelible mark on every subject it brushes against. The mind-body problem is no exception. My characterization of physical determinism employs a conception of the physical that is so broad that it seems to swallow up the mental. In the terminology of events, causes, and effects that the mind-body theorists favor, a physical event in my sense is any event that fits into the spatio-temporal net and is thus a candidate for a cause or effect. Only the most farout dualists would deny that mental events are physical in this minimal sense. Of course, we still have a mind-body problem since it remains to be seen how those physical events we call mental are related to physical events in the narrower sense (e.g., those studied in standard physics). We have seen that physical determinism in the narrower sense strongly constrains any possible answer: mental events must be parasitic on physical events in the narrower sense, else differences in the former are not matched by any differences in the latter and are therefore inefficacious in bringing about physiological acts. Further pressure for an identity relation comes from the notion that parasitism without identity condemns mental events to the limbo of the epiphenominal, denying them a real causal role in producing the physiological act. I will leave it to those who think they know what a 'real causal role' is to adjudicate these issues. All I have to add is that both identity theorists and their opponents tend to operate with a false sense of how easy it is to establish identities in physics. All right thinking physicists believe that macro-thermodynamical quantities, states, and events are parasitic on the microscopic. But it turns out to be hard to characterize the parasitism in terms of identities (e.g., 'temperature is mean kinetic energy' is a glib over-simplification of a very complicated relation which may not in the end turn out to be a relation of identity). I am not suggesting that there are no special difficulties about the mental but only that a more careful look at problems of reduction in physics may point the way for more fruitful attacks on the mind-body question. The more precisely science locates man in nature the more difficult it becomes to sustain a sense of autonomy for human actions.5 As autonomy shrinks so does our sense of uniqueness and worth as well as the basis for a moral perspective on human action. As I have tried to indicate, this difficulty would arise even if the ultimate laws of nature proved to be non-deterministic, but since determinism poses the difficulty in its sharpest form it is appropriate to continue to speak of the determinism-free will problem. As a practical 'solution' I recommend the ostrich tactic: don't think too closely or too long on the issues raised here, and in daily life continue with the presumption that the 'I' that chooses and the self to which we attach value judgments are autonomous. Let those who want to call themselves philosophers bear the risk to their mental health that comes from thinking too much about free will. 1 Clerk Maxwell thought that instability made an opening for free will: "All of the great results produced by human endeavour depend on taking advantage of these singular Ii.e., unstable] states when they occur" (Maxwell (1873), p. 443). But how do we take advantage? The miracle needed to contravene natural laws at an unstable point may be 'smaller' than that needed to contravene them at a stable point but it is nonetheless a miracle. 2 See Frankfurt (1969) for criticisms of the 'could have done otherwise' formula as a necessary condition for freedom and responsibility. 3 Recall the Mill-Ramsey-Lewis account of laws endorsed in Ch. V.
4 But might not the agent help to produce the actually observed relative frequencies by 'reducing the superposition' as the Projection Postulate of quantum mechanics (recall Ch. XI) seems to require? 5 Nozick (1981) and T. Nagel (1982) make this point in especially forceful ways. What is the explanation of the recent and growing trend among hard-headed analytic philosophers to reject the compatibilist solution? Clifford Williams' (1980) Free Will and Determinism: A Dialogue gives a quick 58 page introduction to some of the basic moves in the determinism-free will controversy. Bernard Berofsky's (1966) collection Free Will and Determinism contains many of the classic papers. Gary Watson's (1982) Free Will collects some of the more recent articles. The more intrepid readers will want to consult the chapter on "Free Will" from Robert Nozick's (1981) Philosophical Explanations and Paul Meehl's (1984) "Psychological Determinism or Chance: Configural Cerebral Autoselection as a Tertium Quid."